Teatime for Indonesians doesn’t require fancy scones and jams. We only need our gorengan. 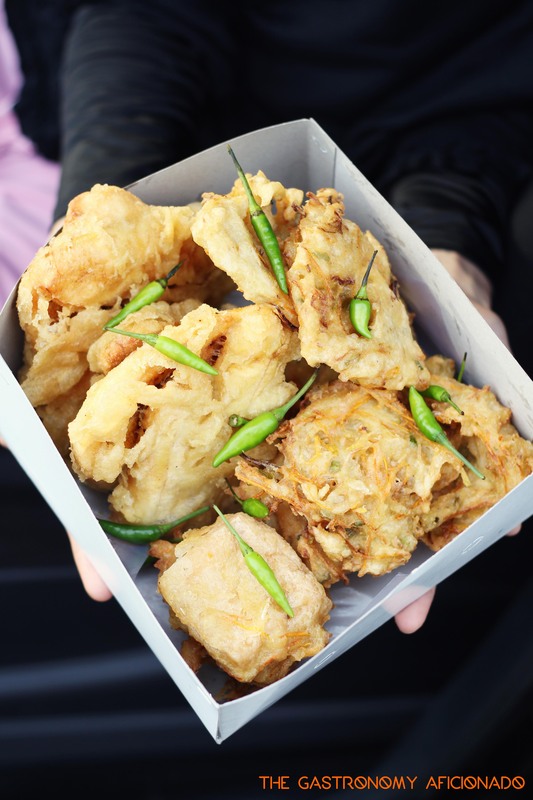 For that, we take a look at a fritter hawker in East Jakarta. What used to be a marshy area east of The Big Durian, Cipinang is now a new center of attraction as a hub between the city center and the uncharted food trails of East Jakarta to as far as Bekasi. Nowadays, people have started springing up food businesses like crazy here. Among them, a couple peacefully runs a gorengan business since 1988 and has inspired others on this now-busy street of Cipinang Jaya. 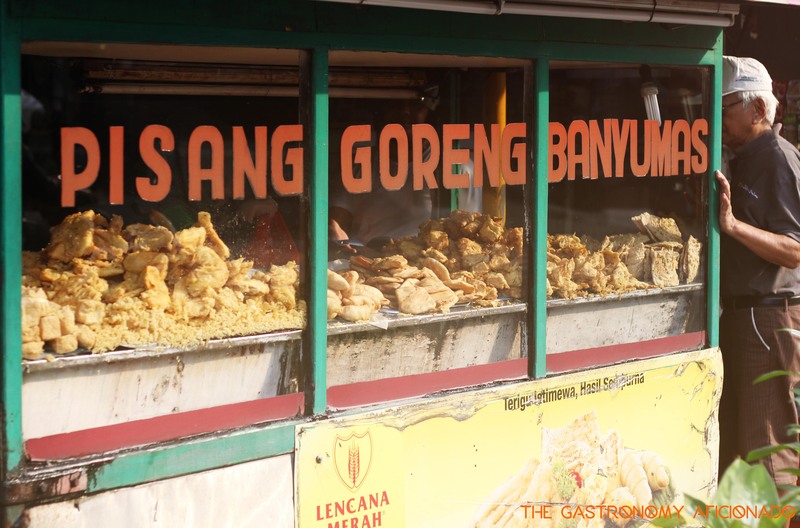 You may have to scrutinize all the street vendors one by one in search for what your tummy wants that day, but a stop at Pisang Goreng “Asli” Banyumas is a must-do while there. In a gorengan stall anywhere, it is uncommon to stay around and eat as most people would just take away their orders and leave. So perchance, if you are curious like me with what happens on every street food kitchen, spend just a little time to observe while you are on a queue. Even simple comfort food like gorengan can be very demanding! On the frontline, a veiled lady was busy serving, answering any inquiries, and keeping up with specific orders from the customers patiently. At the same time, her partner was preparing the dough by putting it individually into a pasta roller. When it gets thin, she then individually wraps it over a banana before frying the pisang molen. It’s a delicacy used to be available only in pastry shops but now, you can find it almost everywhere. The key people were stationed behind two huge frying pans filled with extremely hot oil. The owner, Ibu Sumarni, checks and rechecks whether her bakwans have reached golden perfection and are ready to move on with the following batch. Meanwhile on another pan, her husband stained his bare hands with the batter. Thus he ensured that all the bakwans had been properly coated and then he fried it one by one, risking his hands with oil splashes. Typically, a gorengan stall would have several types of fritters. At Pisang Goreng “Asli” Banyumas, you might want to venture a bit aside from their really good bakwan (vegetable fritters) and pisang molen. The traditionalists would choose the straightforward and lightly battered fried banana or the plain fried tofu, but there are those who like the sweetness of taro rather than banana. Sometimes for me, it’s the thin and crisp tempeh goreng that I choose. For several times I have been there, their bakwan tastes like American fried chicken for some reason. Call me whimsical, but that taste becomes so notoriously familiar and I can relate it right away. As much as I enjoyed it all for myself, among those who became their loyal patrons, the fritters of Ibu Sumarni are not exclusive purchased only for afternoon snacks but also to be shared with others in celebrations or gatherings. “We are about to invite our neighbors for our son’s khitanan party and we are ordering for takeaway tomorrow”, said a customer answering my inquisitive nature. Nothing better than a batch of pisang goreng with a cup of tea. What do you think about pisang goreng cheese? Or pisang goreng topped with other condiments like chocolate sprinkles or honey? I naturally fancy savory stuff rather than sweet but I can’t say no when seeing Pisang Coklat. Grilled right, showered with grated cheese, choco sprinkles and condensed milk. Whewww.. So good!